Vientiane (VNA) – Party General Secretary and President of Laos Bounnhang Volachith praised the effective cooperation between the front organisations of Vietnam and Laos, which he said contributes to enhancing the two countries’ traditional friendship, special solidarity, and comprehensive cooperation. He made the remarks at a reception for President of the Vietnam Fatherland Front (VFF) Central Committee Tran Thanh Man in Vientiane on August 10. 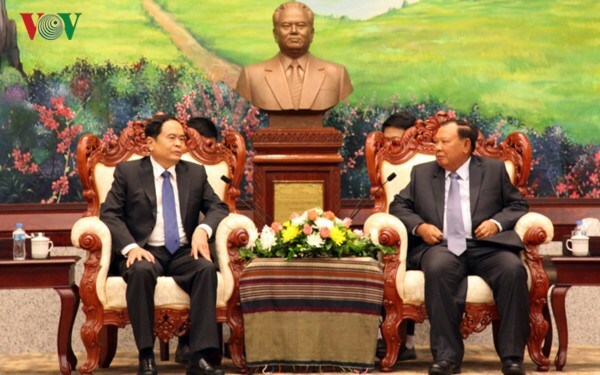 The Lao leader underlined the fact that the working visit to Laos by the VFF President from August 10-13 took place on the occasion of the 55th founding anniversary of Vietnam-Laos diplomatic ties and 40 years of signing the Treaty on Amity and Cooperation. He said it provides an opportunity to educate young generations about the two nations’ close relations. Man briefed the outcomes of his working session with Chairman of the Lao Front for National Construction Central Committee Saysomphone Phomvihane. He said the two sides agreed to increase coordination to implement their joint plans in 2017-2020. The official proposed that the Lao Party chief and President further support the overseas Vietnamese to be granted Lao citizenship and long-term resident permission. He also asked the Lao side to simplify procedures on marriage, business, labour and application for resident alien status for overseas Vietnamese.